I believe by now you have read my previous post on different types of cryptocurrency wallets. In this post, I have elucidated about software wallets, hardware wallets, and paper wallets. And we have also seen which wallet is apt for what purpose. Having said that paper wallets are the cheapest and easiest wallet to make but these wallets require a higher level of crypto literacy before they can be used successfully. But if used smartly, paper wallets can be a handy tool to secure millions of dollars in a simple piece of paper as they can be easily made fireproof and waterproof by incorporating some best practices. Anyways, I think you are already aware of these facts and that’s why you are looking for a reliable way to make a secure Ethereum paper wallet. Note: I would recommend not to Google the website and access it directly from the given link because there are a few Phishing sites that are trying to scam MEW users. # Step 2. Once you have accessed the website, you will see this home page asking you to ‘create a new wallet.’ Just enter a strong password and click ‘Create New Wallet’ option. Also, do save that password somewhere safe on a piece of paper and make it hard to guess because losing this password would mean that your funds will become inaccessible. # Step 3. Now that you have clicked on ‘Create New Wallet’ you will be taken to this screen where it will prompt you to download a ‘Keystore File (UTC/JSON)’. So download this file and keep it safely too. Note: Do not share it! ** Your funds will be stolen if you use this file on a malicious/phishing site. **Make a backup! ** Secure it like the millions of dollars it may one day be worth !! Also, the password encrypts your private key. This does not act as a seed to generate your keys. You will need this password + (your private key or JSON file) to unlock your wallet. # Step 4. 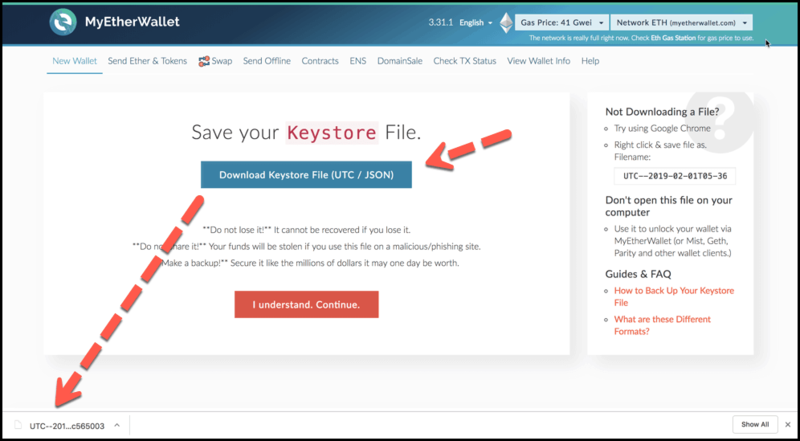 Now once you have downloaded the Keystore File, you can click on ‘I Understand. Continue’ option as shown in the above image. # Step 5. Once you click on this option, you will be taken this screen which will prompt you to save your ‘Private Key’. Please your private key and keep it safe. # Step 6. 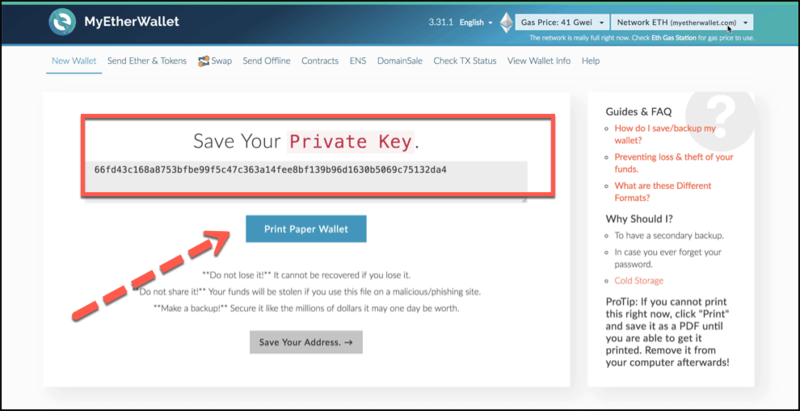 Now once you have saved your private key, you can click on ‘Print Paper Wallet’ and you will be taken on a new webpage prompting you to download your ‘Ethereum Paper Wallet’. 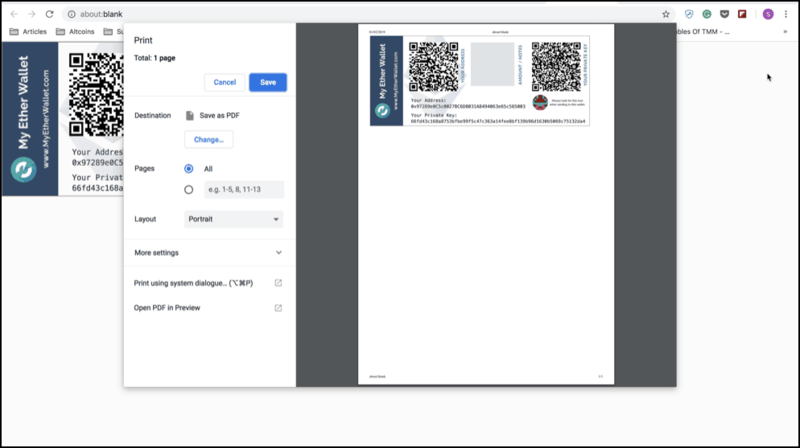 Using this option you can always save your paper wallet in a PDF format for which you can take a print. 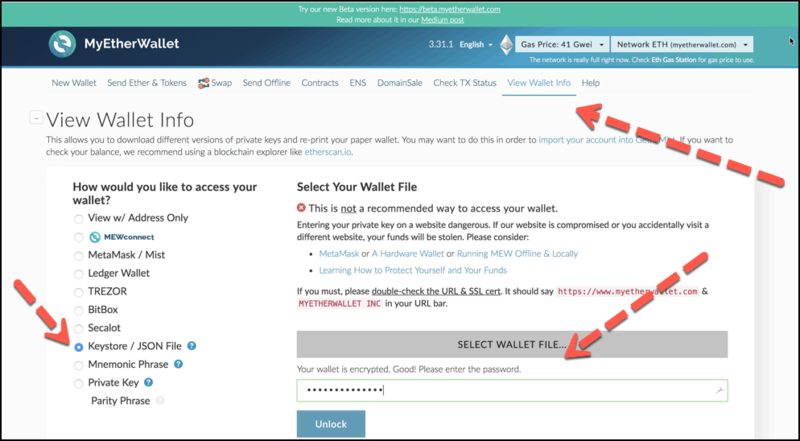 Another easy of getting an Ethereum paper wallet is again through MEW but for this, you need to already have an account on MEW. Step #1. Go to ‘View Wallet Info’ option on MEW. Step #2. Select ‘Keystore/JSON File’ and unencrypt your wallet using the password and JSON file. Step #3. 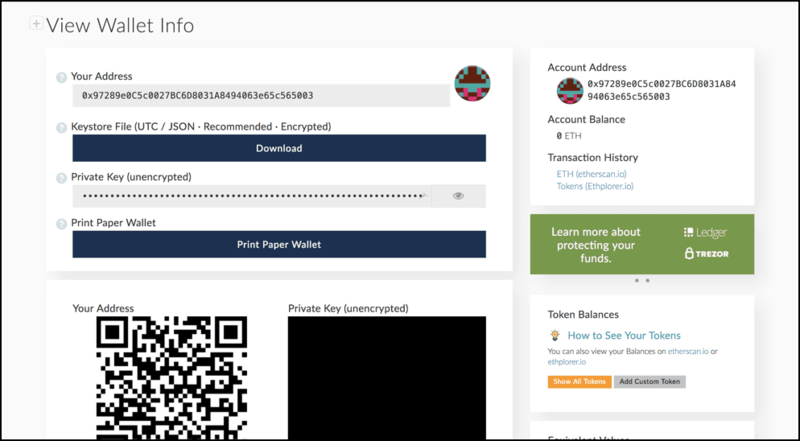 Once you open your wallet, you will be able to see this screen, and on this, you will find the option of printing ‘Paper wallet.’ So click on this, and you will be taken on a new webpage prompting you to download your ‘Ethereum Paper Wallet.’ Using this option you can always save your paper wallet in a PDF format for which you can take a print. So this is how you make a paper wallet for Ethereum if you already have a wallet on MEW. How To Use Ethereum Paper Wallet? Transfer ETH to the public address shown on the paper wallet. And for this, you will be required to scan the address on the paper using your mobile or software wallet. Or you can simply copy-paste the address in your software wallet. After which you can transfer any amount of ETH to the paper wallet. Paper wallets are easy to use, but they require a lot of caution to be exercised by the user because after all paper wallets are simply a piece of paper with private and public keys printed on it. Me: "Use hardware wallets, most people can't do paper wallets securely. DON'T recommend paper wallets to non-experts"
1000 responses: "Use paper wallets, here's how: [complicated insecure method]"
Having said that it is very easy to get exposed while using paper wallets and there have been cases in the past when attacker has just taken a click of paper wallets and emptied the funds from it. Another drawback of the paper wallet is that you don’t get know about your fund’s safety untill you keep checking it frequently whereas software wallets are quite easy to monitor your funds. Lastly, I think paper wallets were required in the past when there was no sufficient crypto infrastructure and other alternatives. But now we have secured options such as Ledger Nano S and Trezor which supports Ethereum like currencies. That’s why I think hardware wallets are a better option than paper wallets. But in any case, if you are comfortable with paper wallets and know how to use them safely, you can very well build one for yourself using this guide. I hope this guide was useful and if it was, please do share it with your friends and family members who are looking to build an Ethereum paper wallet for themselves. And in my next article, I will share how one can export and import private keys safely to use a paper and mobile wallet together. Untill that time keep following TheMoneyMongers for the crypto revolution! !